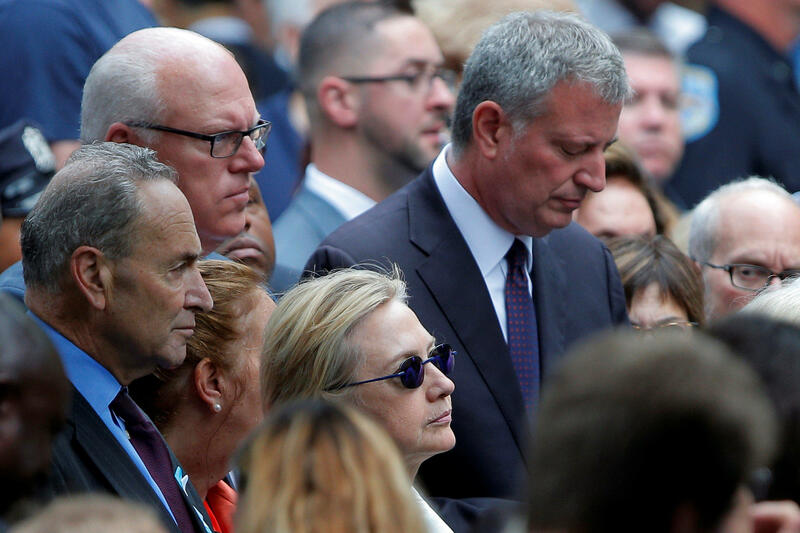 Hillary Clinton left 9/11 memorial ceremony after feeling "overheated"
Hillary Clinton abruptly left the Sept. 11 memorial ceremony in New York City Sunday morning after feeling “overheated,” according to a campaign statement. A law enforcement source confirmed to CBS News senior investigative producer Pat Milton that the Democratic nominee was taken to Chelsea Clinton’s downtown Manhattan apartment by her campaign detail. Clinton arrived at the Sept. 11 memorial in Manhattan at about 8:19 AM, where she chatted with Democratic Sens. Chuck Schumer and Kristen Gillibrand of New York and Joe Manchin of West Virginia. Clinton was expected to stay for most of the ceremony’s duration. Later, the candidate walked away from the area with Secret Service agents in tow at approximately 9:30 AM, before the end of the memorial service, according to pool reports. Clinton arrived at her daughter’s apartment some time later and departed shortly after. The temperature in New York City on Sunday was in the lower 80s, with moderate to high humidity. Clinton left for her home in Chappaqua, New York soon after leaving her daughter’s apartment where, according to a Clinton campaign aide, the Democratic nominee was examined by her doctor, Dr. Lisa Bardack. Bardack released a statement Sunday afternoon about the examination, saying Clinton was “recovering nicely” after becoming “overheated and dehydrated” earlier in the day. Bardack also noted that the candidate had been diagnosed with pneumonia Friday. The incident raises further questions about the health and public records of Clinton and Republican presidential nominee Donald Trump. Last week, when ABC News asked Clinton if the American public deserved to hear more about their medical histories, Clinton seemed to dismiss the need. “Let me say that what we have released is commensurate with what others who have been nominated for president have released. And we followed closely what the format was. We put out the information,” she said at the time. The two candidates have indeed followed precedent when it comes to publicizing a doctor’s summary of their medical documents. John McCain is the only recent major party nominee to have broken the tradition, allowing a small group of reporters to scrutinize over 1,100 pages of his medical records during the 2008 presidential election. John Kerry, the Democrats’ 2004 presidential nominee, also permitted reporters to look at his 36-page military medical records for a brief 30 minutes. For his part, Trump -- in a separate interview last week with ABC -- challenged Clinton to widely release her medical records. “I would love to give specifics, as far as I’m concerned. If she wants to do it, I’ll do it 100 percent,” he said.